Why didn’t you tell me how clutch Target is? I mean, I know it has been around for ages and I’ve been in there plenty of times, but it wasn’t until recently that I realized how magical of a place it truly is. I know they do the bomb collabs with high end-brands and they have that amazing $1 section in the front of the store but guys…I’ve really been sleeping on Tar-Jay! It was a slow and steady courtship. First I’d visit for greeting cards because Target has such an amazing selection for just about every occasion. As our relationship progressed, I ventured over to the home goods section because Target always seemed to have the new and contemporary pieces I was seeking for my home. While there, I’d stop by the beauty section and throw all my coins at it! I was later introduced to the shoes and accessories and became smittened! I fell head over heels when I discovered cart wheel and the sales rack in the women’s clothing section of the store. Target is now BAE! I know, I know, you’re probably like “Trice, seriously? You are so late.” and I get it but sometimes the love you need is right up under your nose and you miss it wasting time at the mall. Haha! But in all seriousness, when I found the exact sun hat I paid dang near $34 for at a different store last summer, in Target, for $3 bucks, and my new favorite sundress for $8, I haven’t turned back. So why am I going on and on about Target? 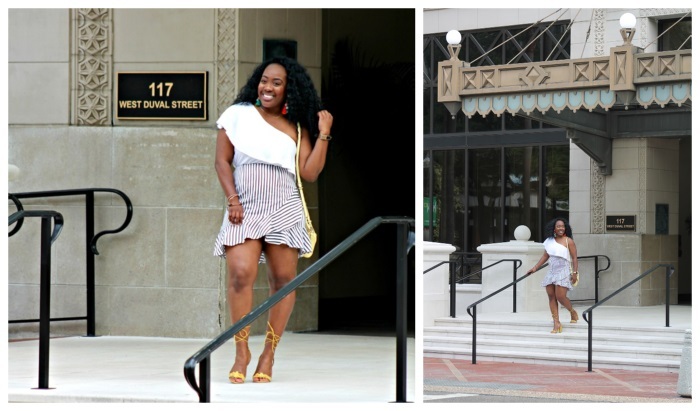 Well, because of the aforementioned and because my new favorite skirt, that I’m rocking in this blog post, came from Target and I got it on sale for a whopping $5 bucks! It was originally $30, it was marked down a couple times, then there was an additional 20% off with the cart wheel app! Ending price, $4.98 plus tax! I’ll take it! 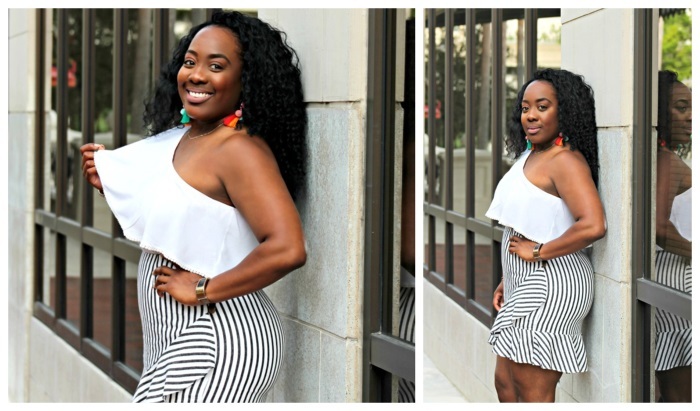 I love that this skirt is ruffled, asymmetrical, black and white striped, and that it hugs all of my curves perfectly! 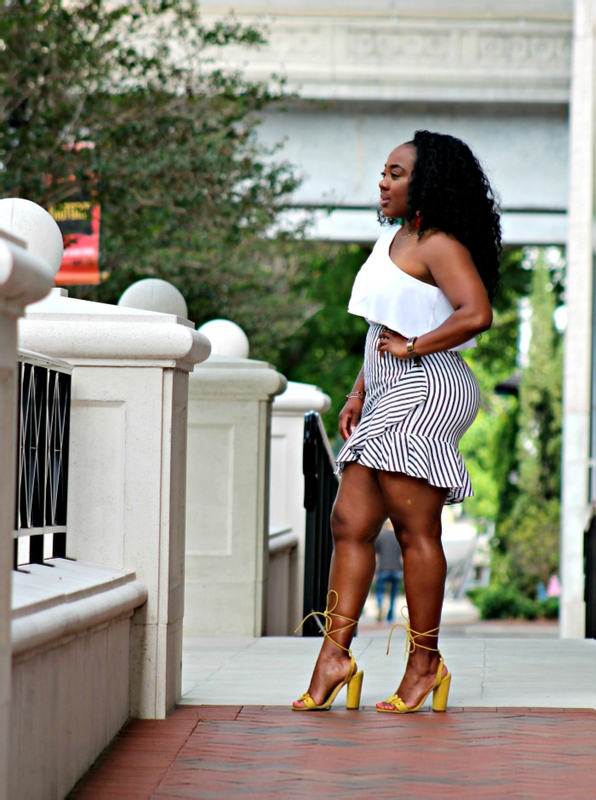 It’s starting to warm up, or shall I say “heat” up, here in Florida and if you know anything about me, you know I’m all about showing off these shoulders honey! This off-one shoulder top was also a steal from a quick run to DD’s Discounts! I believe it also cost $4 bucks! 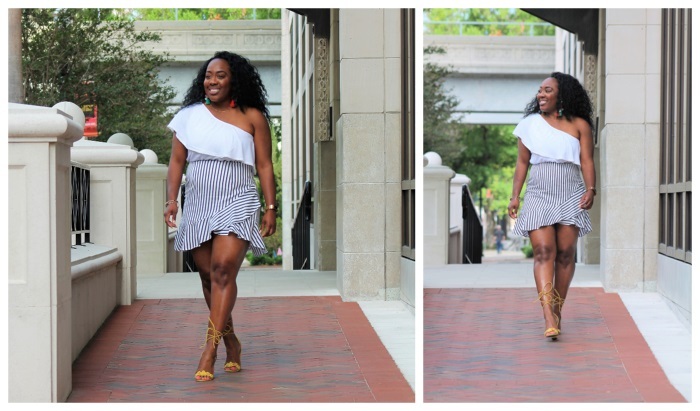 You don’t have to spend an arm and a leg for a cute, and simple summer look! 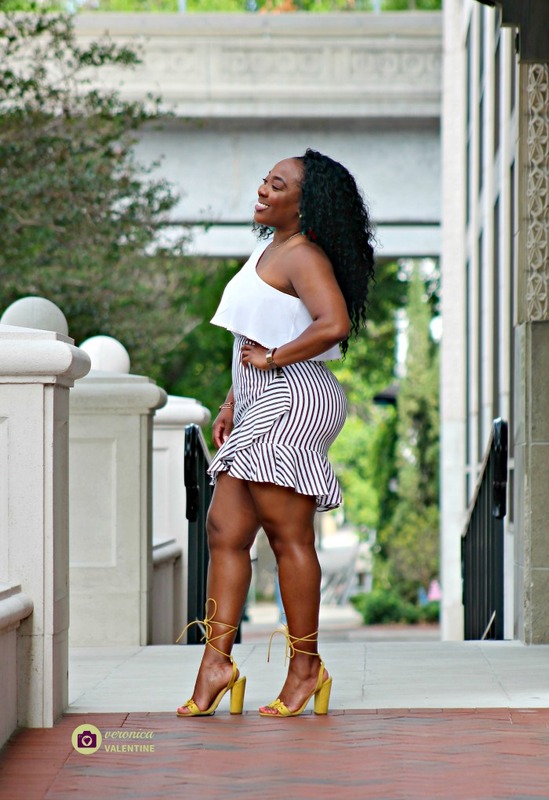 My ShoeDazzle heels and fav Conscious Statement earrings cost the most but the look was well under $50 and it’s super cute! I’m all about a bargain look! So tell me the truth…do you love Target too? How long have you been feeling this way? Are there any others bits of insight you can provide me with to help heighten this new found love of mine? Do tell! Hahaha! As always, thanks so much for stopping by! You all rock my socks! Kinda like how Target has been lately! Previous Post Applebee’s Bigger and Bolder Grill Combos and a Giveaway! Haha, Target has that effect! I love their shoes and furniture! You look fabulous. That skirt is gorgeous on you. I see now! I don't know how I could've missed out all these years. Thank you! Lol! I've heard that Target will trap you if you're not careful. I'm definitely going to be mindful of that. I really love Target! My last buy from there was yesterday, but it was from the home decor dept. although they have been killing it with all of these awesome collections and new brands, I haven’t purchased anything from their clothing dept in ages. I’m such a picky shopper nowadays, but I do have my eye on some pieces that are patiently waiting in my cart. So funny because I've always gone there for stuff other than clothes. I do love their clothes now that i've discovered it lol! You look Fantastic! Target is my Jam and I am always circling the clearance racks as well. It's very rare that I can walk out without dropping some coins. Thank you! I'm definitely gonna have to be careful messing around with Target lol! Lol! Can't believe you have been sleeping on "Tar-Jay"! I love that store , but can be so addictive. You go in for one thing, but end up spending hours buying goodies you dont need. Gotta love Target.